Construction with a square base and four triangular faces; it served as a tomb for the pharaohs of ancient Egypt, represented here by the pyramid of Cheops. Narrow passage used by the workers to exit the pyramid after blocking the ascending passage at the conclusion of the funeral rites. 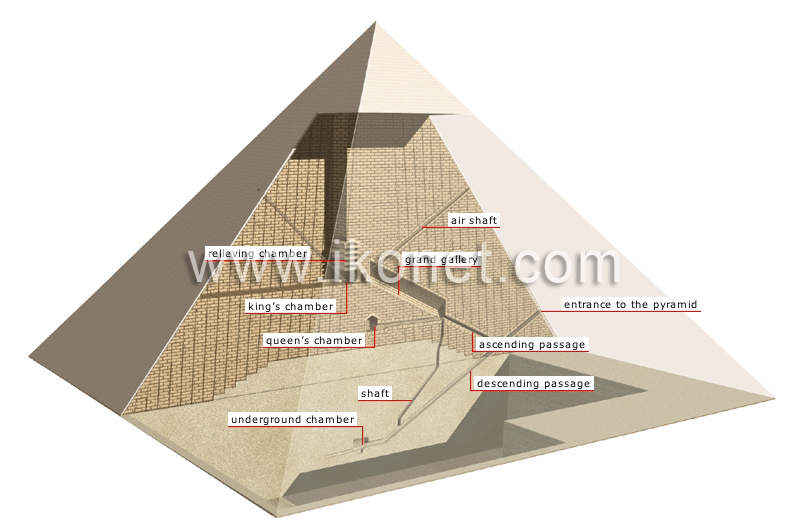 Point of entry into the pyramid. Series of five chambers designed to ease the pressure exerted by the stone blocks on the king’s chamber. Funeral chamber that housed the pharaoh’s sarcophagus. Large passage leading to the king’s chamber. Unfinished chamber thought to be the king’s second chamber; it was probably abandoned because the access passage was too narrow for the sarcophagus. Unfinished chamber located at ground level, believed to be the king’s chamber; it was built in case the pharaoh died prematurely. Passage leading to the underground chamber. Passage leading to the grand gallery.